I have been participating in a lot-​building and decorating contest at the Plumb Bob Keep forums. I know quite a few of my readers hang out over there, but for those that don’t I wanted to show you my entry so far. I spent an absurdly unnecessary amount of time building Lord Colban’s keep, considering how little we will likely ever see of it. So in order to make it worthwhile I decided to do a proper tour, because I know a lot of you are on the lookout for castle-​building inspiration. We’ve already seen the exterior and ground floor of Egelric’s castle, so today we’re going to finish it off. Looking at it nearly 2 years later, my castle-​building techniques have improved (or at least changed) so much it seems like a candidate for a rebuild, but even if I do, it will preserve roughly the same floorplan. Maybe we can even compare before & after shots someday. Devin has asked a couple of times about Malcolm and Iylaine’s house, so the easiest way to answer seems to be a quick tour. I’m too tired to work on a chapter tonight, so now’s a great time to give you a “before” tour of Osh’s new house—before Flann gets her decorating hands on it, and Osh starts painting. 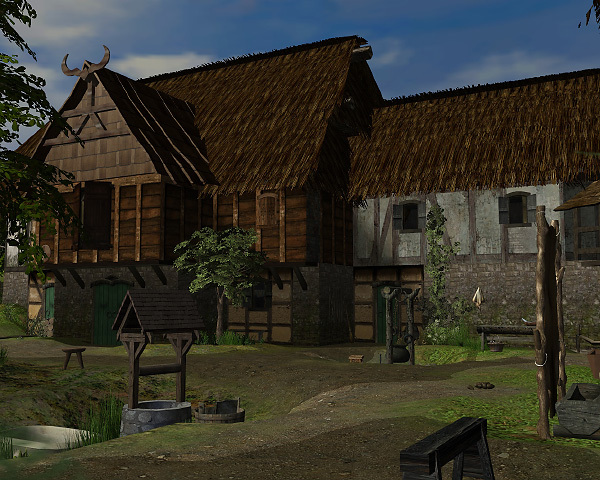 While looking for Irish castle plans (Murchad is going to be needing a castle, if you must know) I stumbled across an excellent resource for Sims castle builders. This site showcases castles built using Legos, and the builder also includes plans for each of the 114(!) castles he has built. He has not only the plans of the actual castles, with all their curves and awkward angles, but also the plans he drew for his Lego castles. These are doubly interesting to us since he is forced to build on a grid of squares just as we are. He even built Warkworth Castle, which was the inspiration for Egelric’s castle! I wish I had found his site when I was working on it. As I mentioned in that post, the meager plans I used for Egelric’s castle are included on this site, which consists of scans from an old book about the growth of the English country house. But this gentleman has really done his research, including leaving his computer and going to an actual physical library. Thereby saving me the trip!